Excursion into Hungary's history Transport from Vienna to Budapest via Danube Bend. Private car transfer with English speaking driver. - General Informations about Vienna to Budapest transport with full day scenic tour to the Danube bend: distance Vienna - Budapest with the Danube Bend: 300 km (186 miles) duration: approx. : 8 hours. - Premium private car service, taxi, minivan, minibus from Vienna, Austria to Budapest, Hungary or other destinations in Hungary. The train, bus or flight may not set off, when appropriate for you, but We can adapt ourselves according to your needs. The private road transport is more comfortable than travelling by train or coach. Choose comfort and security! We provide private car tranfers with Hungarian + German + English speaking driver between Vienna Airport or Vienna city and Budapest, Hungary. We do not have scheduled or collective transfers, you or your group members are the only passengers in the car. The prices are fixed for the transfer cars, not per person. Of course you can book return car transport from Budapest to Vienna with full day excursion to the Danube bend too. - Click here to see our PROMO VIDEO! 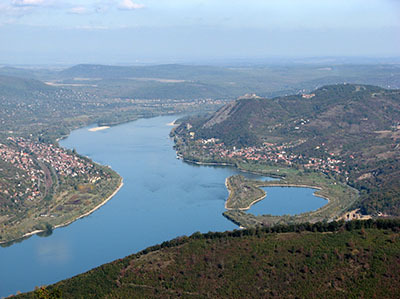 The river Danube, is Europe's second longest river after the Volga. It is classified as an international waterway. The river originates in the Black Forest in Germany as the much smaller Brigach and Breg rivers which join at the German town of Donaueschingen. After that it is known as the Danube and flows southeastward for a distance of some 2850 km (1771 miles), passing through four Central and Eastern European capitals, before emptying into the Black Sea via the Danube Delta in Romania and Ukraine. Known to history as one of the long-standing frontiers of the Roman Empire, the river flows through or acts as part of the borders of ten countries: Germany (7.5%), Austria (10.3%), Slovakia (5.8%), Hungary (11.7%), Croatia (4.5%), Serbia (10.3%), Bulgaria (5.2%), Moldova (1.6%), Ukraine (3.8%) and Romania (28.9%). Hungary Danube bend - Esztergom is a city in northern Hungary, 46 km north-west of the capital Budapest. It lies in Komárom-Esztergom county, on the right bank of the river Danube, which forms the border with Slovakia there. Esztergom was the capital of Hungary from the 10th till the mid-13th century when King Béla IV of Hungary moved the royal seat to Buda. 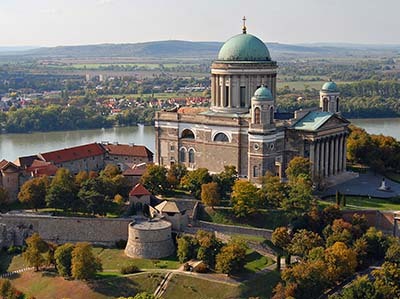 Esztergom is the seat of the prímás (see Primate) of the Roman Catholic Church in Hungary. It's also the official seat of the Constitutional Court of Hungary. The city has the Keresztény Múzeum, the largest ecclesiastical collection in Hungary. Its cathedral, Esztergom Basilica is the largest church in Hungary. Esztergom is one of the oldest towns in Hungary. - Visgrád: was first mentioned in 1009 as a county town and the chief town of an archdeaconry. After the destructive Mongol invasion of Europe in 1242, the town was rebuilt in a slightly different location to the south. King Charles I of Hungary made Visegrád, his hometown, the royal seat of Hungary in 1325. In 1335, Charles hosted at Visegrád a two-month congress with the Bohemian king, John of Luxembourg, and the Polish king, Casimir III. It was crucial in creating a peace between the three kingdoms and securing an alliance between Poland and Hungary against Habsburg Austria. Another congress followed in 1338. Sigismund, Holy Roman Emperor and King of Hungary, moved the royal seat to Buda between 1405-1408. King Matthias Corvinus of Hungary used Visegrád as a country residence. Visegrád lost importance after the partition of the Kingdom of Hungary following the Battle of Mohács in 1526..
- Visegrad Upper Castle: After the Mongol invasion, King Béla IV of Hungary and his wife had a new fortification system constructed in the 1240-50s near the one destroyed earlier. The first part of the new system was the Upper Castle on top of a high hill. The castle was laid out on a triangular ground plan and had three towers at its corners. In the 14th century, at the time of the Angevin kings of Hungary, the castle became a royal residence and was enlarged with a new curtain wall and palace buildings. Around 1400 King Sigismund also had a third curtain wall constructed and enlarged the palace buildings. At the end of the 15th century, King Matthias Corvinus had the interior part of the castle renovated. The Upper Castle also served for the safekeeping of the Hungarian royal insignia between the 14th century and 1526. In 1544 Visegrád was occupied by the Ottoman Empire, and, apart from a short period in 1595-1605, it remained in Turkish hands until 1685. The castle was seriously damaged by the Turks and was never used afterwards. The castle is now open to the public for visit. - Szentendre: (Serbian language: Сентандреја, Sentadreja) is a riverside town in Pest county, Hungary, near the capital city Budapest. It is known for its museums (most notably the Open-Air Ethnographic Museum), galleries, and artists. Due to its picturesque appearance and easy rail and river access, it has become a popular destination for tourists staying in Budapest. There are many facilities, including souvenir shops and restaurants, catering to these visitors. Populated for well over a millennium, under the Romans it was called Ulcisia Castra, meaning "Wolf Castle". Since the 16th century it was considered the center of the Hungarian Serb community. At one point it had as many as eight Serbian Orthodox church buildings and 3 chapels, and only one each Roman-Catholic and Evangelical. It is still the see of the Buda Diocese of the Serb Orthodox Church. Szentendre and the surrounding villages were also inhabited by Bulgarians ever since the Middle Ages. In 1690, the Serbian teacher and hegumen Stevan notes that Szentendre was even called Bolgarija by some. It had a Bulgarian neighbourhood of settlers from Chiprovtsi and a Chiprovtsi church. The names of locals clearly hint at a Bulgarian population. 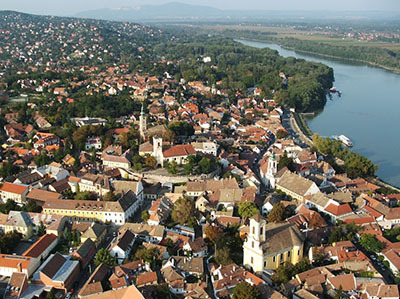 In the 18th century, after liberation from the Turks, Szentendre enjoyed a rebirth with Mediterranean leanings, as Serbian, Croatian, Slovak, German and Greek newcomers moved in and lived alongside the Magyar inhabitants. According to the 1720 data, 88% of the population of the town were South Slavs (mostly Serbs, but also some South Slavic Catholics). The town to this day is characterised by a south European atmosphere with much baroque architecture, churches of various faiths, narrow sidestreets, and cobblestone roads. - Program and sights - Danube Bend full day scenic tour: In Esztergom Visiting the Basilica and Treasury and taking a short walk at the centre of the first capital of the country. Travelling further to Visegrád, where we visit the citadel and the castle museum firstly, and then we eat a royal meal (word for word!) at the Renaissance restaurant (atmosphere of the 15th century, renaissance food and music). If we are able to walk we will continue our journey to Szentendre, where we can stay for two hours. It is hard to list all the sights, which are waiting for us there (e.g. the world famous Margit Kovács Museum, the Village Museum, where the time has stopped etc.). - Duration: total 8 hours with 3 stops in Esztergom, Visgrád, Szentendre. Esztergom Hungary, Danube bend. One of our clients favorit trip: an AMAZING TRANSFER between Budapest and Vienna with an full day excursion VIA DANUBE BEND IN HUNGARY. The most beautiful part of the journey is VISEGRAD. A direct car transfer from Budapest to Vienna (or vice versa) does take 2 - 3 hours ... it's a very boring trip:) We have a bettert suggestion for you, if you want to see nice places during the journey: - it's the Danube bend.